...Comments section for easier viewing and reading of text bubbles. 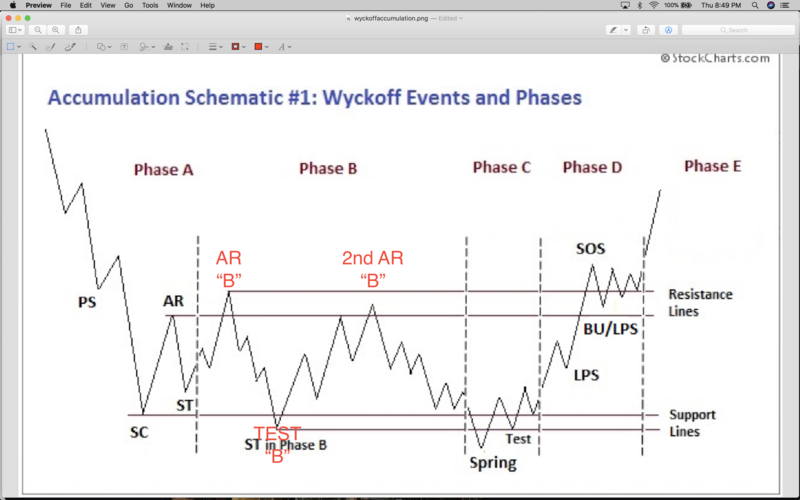 Phase C is beginning in this Wyckoff Accumulation Schematic #1 for BTCUSD BitStamp "IN MY OPINION." It is in phase C that the coin/stock price goes through a decisive test of the remaining supply, allowing the “smart money” operators to ascertain whether the stock is ready to be marked up. A spring is a price move below the support level of the TR (Trading Range) established in phases A and B that quickly reverses and moves back into the TR . It is an example of a bear trap because the drop below support appears to signal resumption of the downtrend. In reality, though, this marks the beginning of a new uptrend, trapping the late sellers, or bears. 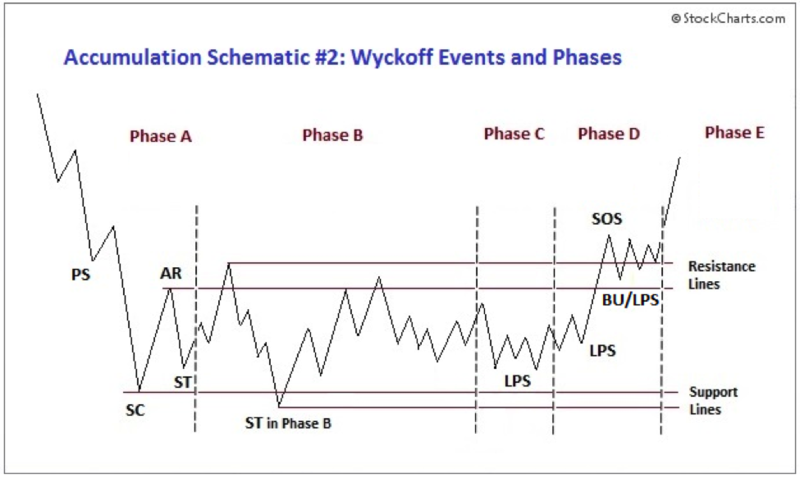 In Wyckoff's method, a successful test of supply represented by a spring (or a shakeout) provides a high-probability trading opportunity. A low-volume spring (or a low-volume test of a shakeout) indicates that the coin/stock is likely to be ready to move up, so this is a good time to initiate at least a partial long position with the capital you're willing to invest in the particular coin/stock. The appearance of a SOS (Sign Of Strength) shortly after a spring or shakeout validates the analysis. 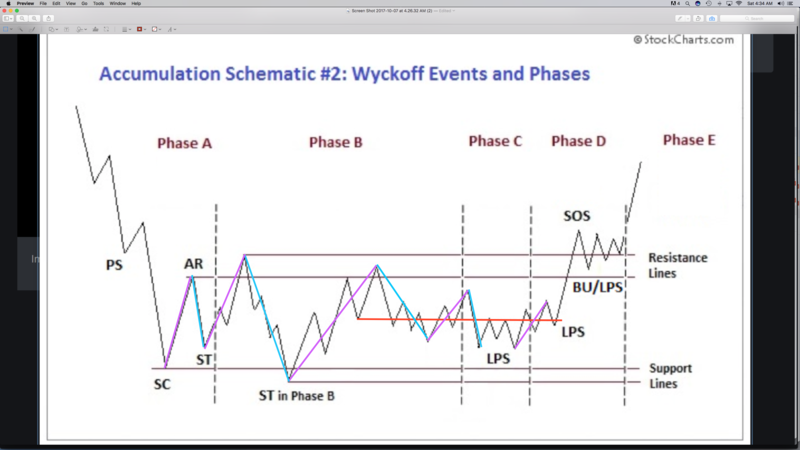 As noted in Accumulation Schematic #2 in this link http://stockcharts.com/school/doku.php?i... , however, the testing of supply can occur higher up in the TR without a spring or shakeout; when this occurs, the identification of phase C can be challenging. Charts with indicators will follow soon. 評論: TURN UP THE VOLUME and WATCH THE BITCOIN PRICE TICKER WHILE LISTENING TO HER COMMENTS. 評論: I've had very little sleep the past couple of days while working on 2017 year end taxes for my business. I thought I would post an update before getting some sleep. I need to get up very early in the morning. It's already 1:18am here. 評論: I posted the BLUE text bubbles again to let everyone know it's POSSIBLE we are still in Accumulation but in a much larger trading range. 評論: Is it possible we could be in store for several months of sideways for the purpose of accumulation after dropping from $19,666 to $5,920 (A 70% drop)??? Sure, it's possible. I'm not going to say that will NOT occur but it's my opinion that scenario is not as likely as the one I envision with a Wyckoff SPRING beginning mid March to Mid April and coming to a climax in mid May to mid June. 評論: We are currently around the 0.618 FIB RT (ReTrace) at $8,123.82. Here's a look at the indicators in the 180m TF. It's certainly possible we get a bounce up around this 0.618 FIB RT when looking at the indicators. I'm still trying to determine if we stay up off this bounce. If we go below the lower black line of that LARGE BLACK WEDGE I've drawn on the chart, then it's likely we are following the Blue Schematic and not the Black Schematic. 評論: I'm learning we should give the Daily (1440m) and 2 Day TF Godmode 3.1 Mod with LSMA indicator much more respect when the LSMA has peaked above 80% and on it's way down to 20% and lower level. Meaning, if it has not made it down to 20% level yet after coming down from an 80% or higher peak, we should probably be VERY careful about drawing conclusions of a potential reversal. "Meaning, if the Blue LSMA has not made it down to the 20% level yet AFTER coming down from an 80% or higher peak, we should probably be VERY careful about drawing conclusions of a potential reversal UNTIL THE BLUE LSMA HAS MADE IT DOWN TO THE 20% OR LOWER LEVEL. Hopefully, that made my previous statement more clear. 評論: I'M STILL STICKING TO "WE ARE IN ACCUMULATION SCHEMATIC AND NOT DISTRIBUTION. The Black Schematic I first posted was rejected and the Blue Schematic is in play. Now that the Blue Schematic is in play, we have two possibilities. We will not realize WHICH Accumulation Schematic we are in until another 3 to 14 days. 評論: The black lines with arrows I've drawn on the previous chart to depict POSSIBLE future price movement IS A MIXTURE of both Accumulation Schematics #1 and #2. I should have took time to do this yellow schematic a little better but it will suffice. 評論: We are currently looking more like Accumulation Schematic #1 (Yellow). However, do NOT think we must go down below previous low of $5,790.72. We can go down to a level higher than previous low before going up to test Supply again. I feel pretty good that wherever we go down to here, we will not stay down long at all. I believe we will come back up to the magenta BASE rectangle I placed on the chart. I'm "speculating" $7,200 to $7,555 range as low as we possibly go. Some may think I'm "crazy" for saying ONLY that low and not lower. I honestly don't care. I'm simply giving my "opinion." 評論: The 180m and 360m TF's I posted previously are what I consider, "Short Term." This 720m (12h) and 1440m (Daily) are what I consider, "Mid Term." Pay no mind to the red lines on the chart in the 2-Day and 4-Day. I have not updated those according to these higher TF's. 評論: I'm not creating a new publication yet to make this report. Those who have follow me may be the fortunate ones to realize NOW may be the perfect time to get in long. Explained in the Purple text bubble... You'll know what I mean if you followed this publication from the beginning. 評論: StoneLuv (below) said, "How many times is an analyst allowed to change their mind before they aren't taken seriously?" "I could care less what you think. If you don't want to take me seriously, that's your prerogative." My "ideas" I post are NOT forcing anyone to make their trades based on MY IDEAS. What I'm posting is simply an "IDEA." If you don't like the idea, I would appreciate you not being sarcastic in remarks in the comments section. If you don't agree with the idea and wish to post an IDEA of your own in the comments section to ENCOURAGE DISCUSSION, I'm totally fine with that. I want to encourage discussion. However, if your only intent is to be sarcastic and demeaning, I WILL report you to moderators. 評論: 1 hour remaining on current 12h candle. We may have a decent chance of a turn to the upside within the next 1 to 13 hours based on what we're seeing with the Phoenix ARI and Stochastic RSI. 評論: A new X22 Report Spotlight video involving Crypto just came out about an hour ago. 評論: Per request of CashFlowCrypto, I'm posting the following TF's for those who use Godmode and Stochastic RSI: 60m, 120m, 180m, 240m, 360m, 720m, 1440m, 2-Day, 3-Day, 4-Day, 5-Day and 7-Day Time Frames in the "Followers Comments" section below. Simply scroll down more and you will see them. @ProwdClown can you post another screen shot of your chart with the current and updated Phoenix 1.393 and Phoenix Ari/Stoch RSI indicators? I don't have access to those. Really appreciate buddy. Thank you in advanced. @CashFlowCrypto, Any particular Time Frame or multiple TF's? 180, 360, 720, 1440, 2-Day and 4-Day? I'm posting the following TF's for those who use Godmode and Stochastic RSI: 60m, 120m, 180m, 240m, 360m, 720m, 1440m, 2-Day, 3-Day, 4-Day, 5-Day and 7-Day Time Frames. @ProwdClown, YAY!!!! you're the man!! Hypothetically speaking what happens to the schematic if we break our base and trendline to the downside? Depends on how much to the downside as to whether I would say we are officially in a Distribution Schematic with a SOW (Sign of Weakness) Phase D.